← Major Environmental Engineering study slams Barbados Government over imminent death of last Mangrove wetland. Government destroying RAMSAR natural heritage site. 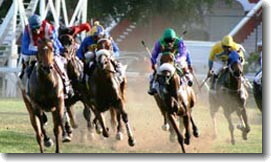 The Barbados Turf Club’s refusal to allow a racehorse to be saddled in the stall across from saddling enclosure, a practice regularly done by trainers when horses are acting up, resulted in the later death of the animal when it reared and fell striking it’s head on the asphalt on April 28, 2010. After the fall connections and other grooms and trainers tried to save the animal and waited in vain as the BTC could not get a vet for over 45 minutes and then no vet had anything to give to help the animal. I hope those who were involved in the decision that caused this poor animal its life do BURN in hell. This was a truly unforgivable decision and a disgrace to the racing industry. I hope the news reporters investigate this matter and give the animal the satisfaction of knowing that its unjustified death was not unpunished and not left without a thorough investigation. Editor’s Note: This article was originally submitted as a comment on our story Since 1845: How many jockey & horse injuries & deaths at The Garrison? The article has been edited by BFP for sentence structure and to remove an objectionable phrase that does not meet BFP’s editorial policies. Readers are cautioned to remember that this article has been submitted anonymously and should therefore be taken with a little salt just like all anonymous sources and just like all news whether on the TV, radio, newspapers or the net. That said, this story from an insider at the Barbados Turf Club makes serious allegations against BTC management and operations. Barbados Free Press will be pleased to print any response from the Barbados Turf Club exactly as received. A friend of mine was present when the incident happened and told me about it. He descibed in detail what happened and spent some time watching it. It upset him quite a bit. Barbados is horrible in the way it treats innocent animals and it is time something is done about it. Where are the animal rights people. Firstly let me say that the accident was unfortunate, but I do not believe that the horse was on the ground for 45 mins before being seen by a vet. Secondly I know for a fact that the first vet to the horse after a brief exam determined that the best thing to do was euthanasia. The vet was not given permission to do so by persons connected to the horse. Thirdly hindsight is 20/20. I think most people in racing hate to see horses injured or killed. I surely do.No one could predict what was going to happen. Thanks for your contribution, Racer. That’s the great thing about blogging – it allows good people with different perspectives and memories of an event to discuss and think. It is obvious that the author of this article loves horses and is upset by what he sees as a needless death. Yes, hindsight is always 20/20 (I shoulda bought more Apple stock when it was $50!) but it is also true that we can and should learn from mistakes and tragedies so they don’t happen again. If this discussion prevents a recurrence then we’ll be satisfied. Once again, thanks for your valuable comment and perspective on an important event.